I recently met with a gentleman who was employed by the union as a contractor. He had long stretches of unemployment and other stretches of high employment. He wanted to hear from me as to when was the right time to file chapter 7 bankruptcy. His situation is somewhat unique. He will work for stretches of time ranging from 2 to 6 months where his income is very high. He then has long periods of time when he has no income at all. It is during those months where he receives unemployment insurance benefits. At the time we met, he was in between jobs but expected to start imminently another stretch run which would last 2 to 3 months. It is clear that the right time to file chapter 7 bankruptcy for this individual would be when he is in between jobs with nothing on the horizon. His yearly income of $50,000 per year still falls below the annual median for a household of his size. However, if the files at the time when he is gainfully employed, his monthly income is going to exceed his monthly expenses which would knock him out of a chapter 7 situation. While the timing was particularly important for this individual due to his fluctuations in employment, most people do not have that same problem. Most people are on either an hourly wage or a salary and the amount that is brought in per month rarely fluctuates at all. 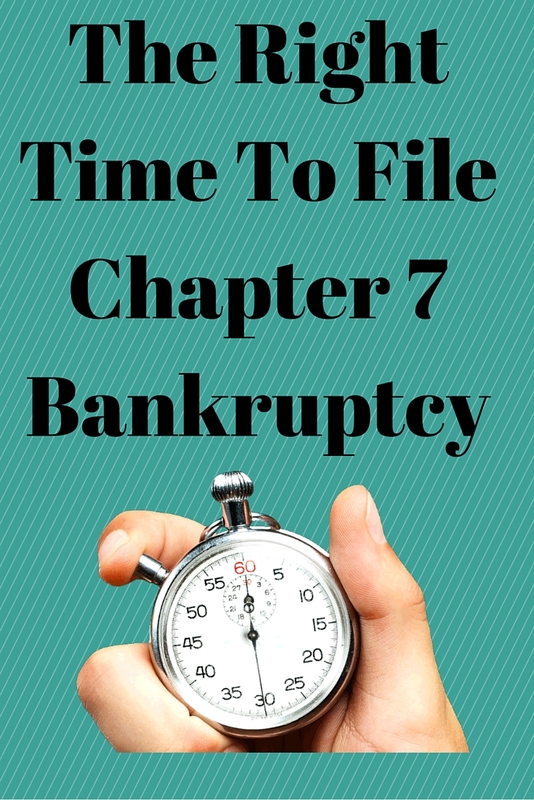 For these individuals, the right time to file chapter 7 bankruptcy would be just about any time except if an asset is expected to arrive. Such an asset would be a tax refund in excess of the amount protectable by State of Illinois exemption laws. Another such asset would be an inheritance if one was expected. Another asset would be a retirement benefit which was converted into non-exempt property. For others, the right time to file is immediately upon the receipt of a summons and complaint. Additionally, a person may have just received a wage garnishment or bank citation. In other cases, a vehicle may have been repossessed. In some cases, a person may be subject to a foreclosure sale and but for the filing of a bankruptcy case, the property would be lost. So each case is a little bit different. The best advice is to meet with an experienced bankruptcy attorney to determine whether or not you qualify for chapter 7 and whether or not now is the right time to file. As the example listed above indicates, filing at the wrong time can cause the case to be dismissed, converted to a different chapter or the debtor can be forced to lose property that would otherwise be protected if the filing was timely. For more information on filing chapter 7 bankruptcy and to learn your rights under the United States Bankruptcy Code, you can contact my office directly at 847-520-8100. We have seven offices to serve you and we have resources available for you on our website. You will find the attorneys to be very understanding of your circumstances as we have handled thousands of cases since we began practicing in 1991.